ANYWAY. 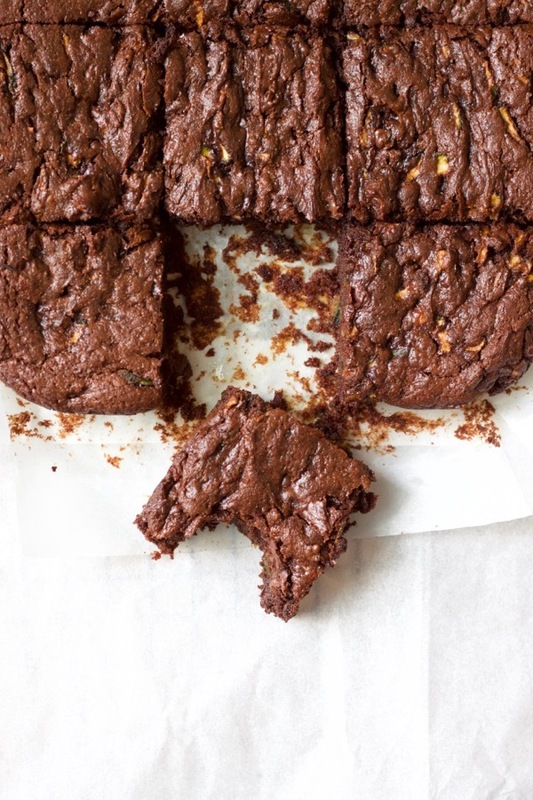 This is a magical flourless double chocolate zucchini cake that’s perfect for a special snack or a totally legit dessert! It’s healthy (mostly veggies and almond butter, y’all), super filling so you don’t need a snack again in 10 minutes, and checks the chocolate chip AND cake craving boxes my kids apparently have on a daily basis. Plus it’s fun for kids to help make because you just dump everything into a bowl and mix – I let my almost-2-year-old help with this and it wasn’t disastrous (unless you call licking the spoon and then stirring a little more disastrous). I’ve been using these parchment paper sheets for baking lately and not just to line a sheet pan, and it’s pretty glorious to not have to scrub the corners of a cake pan! Oh, and all those zucchini shreds you see in the batter virtually disappear in the finished cake. It’s very sneaky! 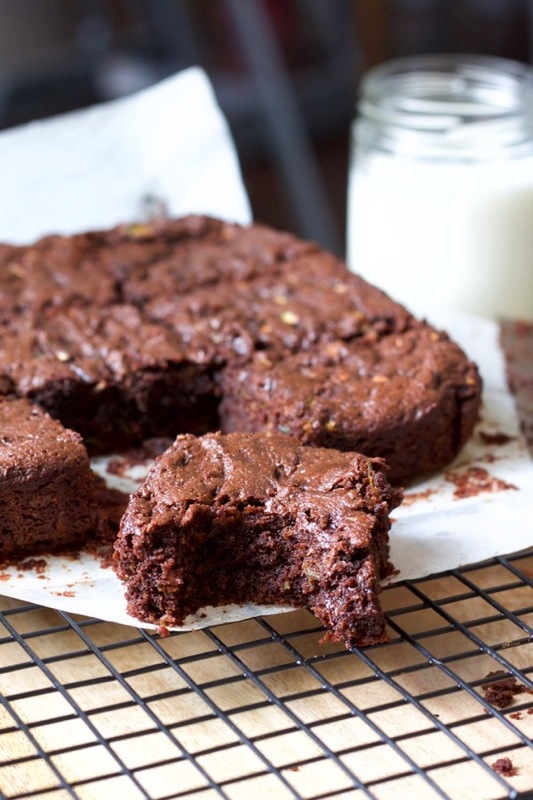 The cake is moist, dense, and SUPER chocolatey! You don’t taste zucchini or almond butter, in my opinion, even though those are the main ingredients. It honestly just tastes like chocolate cake, like a fluffy, not-as-sweet brownie. 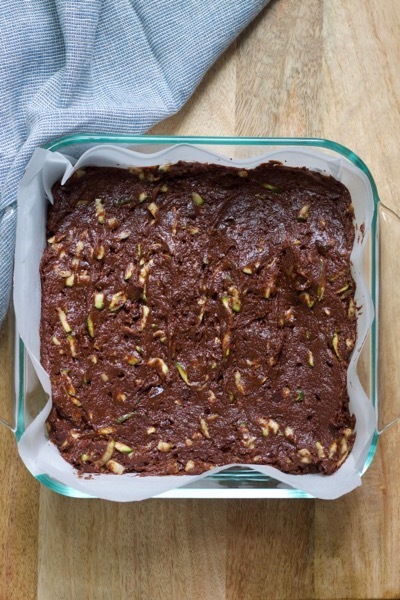 This recipe is based on this flourless chocolate chip zucchini snack cake – I just tweaked a couple of things to add cocoa powder for a double chocolate version. Both are delicious and are huge staples during zucchini season around here! Can I have a snack? Can I have chocolate chips? Do we have cake? Yes, yes, yes. Preheat the oven to 350 and shred the zucchini. Err on the side of a little extra rather than skimping – I could press mine down to 1-1/2 cup, so it was a loosely packed/piled up 1-3/4 cup. 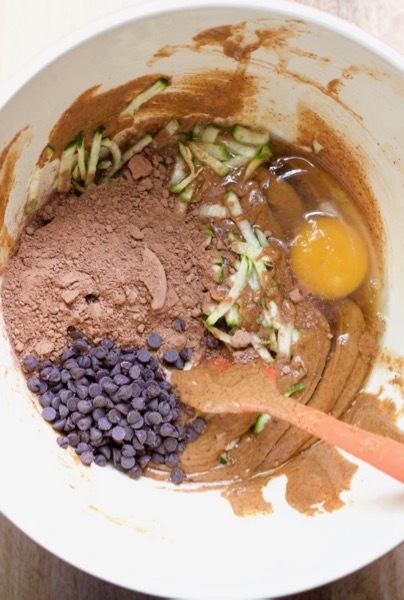 Mix all ingredients in a mixing bowl until thoroughly combined. 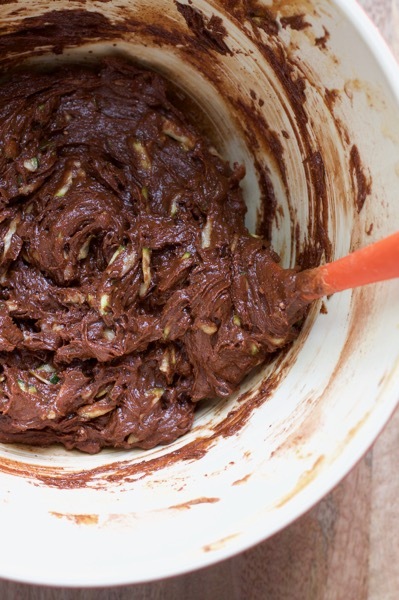 There’s no particular order or mixing method – just dump it all in and stir! Transfer the batter to a greased (or parchment-lined) 8×8 pan and bake 35-40 minutes or until the cake tests done (a toothpick will come out clean with maybe a few crumbs). This sounds and looks amazing! Can’t wait to test it out myself! Thanks Mindy! I would love to know what you think if you give it a try! Just finished making th7s cake! Can’t wait to try it. Smells devine! Thank you!